I’m a three year old tortoiseshell girlcat with loads of luscious brown and black fur, and some killer golden eyes - if I do say so myself." "And at the tender age of 3.5 years, I already know exactly what I want out of life! You see, I’m a bit of an adventurous girl, and I love hanging around kids. 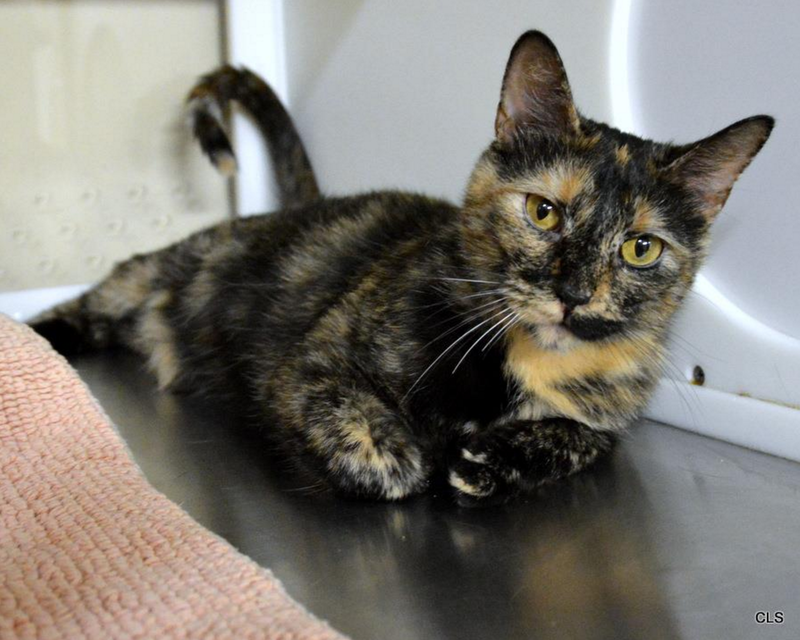 In fact, my friends at Wayside tell me my purrsonality type is Sidekick, which means I'm a pretty outgoing girl and will be great company around the house. And I just love human attention. I lap it up like one of those drooly dogs I see walking outside here at the shelter. Psst ...I'm known for giving out mean headbutts to show my affection, too! And now it's confession time: I am not a dog perso-- uhh, cat. Other kitties? Sure. Kids? Bring'em on! Dogs? Nope. Never. Nada. Not my cup o' catnip. But hey, there are loads of cat people with kids out there - I just know it! And I know this will be my last stop before I find the people I’ll spend my life with. Maggie 's available at Allie's Alma Mater, Wayside Waifs. Miss Maggie - you are lovely and we know the right family is out there for you! What a cute introduction, Maggie! Your outside AND inside beauty will bring a family to you soon! What a beauty you are, Maggie! I hope you find your new family soon. Maggie, you are breathtakingly beautiful. I bet you know how to rock your tortitude too! Awwwwww! Maggie is a darling for sure. Hope that family comes along soon. She is beautiful. I hope Maggie gets her forever home soon. Too bad you don't like dogs, Maggie - otherwise, you'd make a great therapy cat! But no matter, it still sounds like you are AWESOME, and I hope you find a home soon! You are such a purrty gal! Hope you get your hearts desire soon! Oh how cute tortoiseshell! I hope she'll find her own home soon!